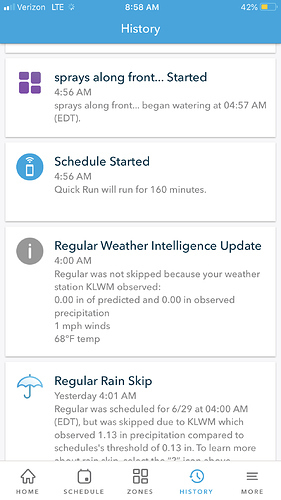 Weather intelligence - not skipped. Irrigation did not turn on. Thoughts? @Lacrosse14 I’ll have the engineering team review. @theflexdude should be able to identify what happened in this scenario. Will make sure we followup with an explanation of what is found. Looks like the schedule was updated to start at 3am instead of 4am after we detected a climate skip for the 4am run. Then the 4 am skip got removed at 3:01 am, but we were unable to add the run back as it is past it’s 3am start time. I will need to see if we can handle certain situations better and keep skips in sync with schedule updates. Thanks for sharing! Same problem here July 7. Unfortunately happened just as we were enduring major heatwave. If I hadn’t checked I’d be replacing a lot of plants. So a fix would be welcome. We will be releasing a software update tomorrow for the case mentioned above. It is related to schedule start time modification and skips. Was your scenario the same or did it also have manual interaction? No manual intervention. My zone 7 started as scheduled. Five hours later I got intel update saying my Zone 5 would not be skipped because there was no rain forecast. 45 minutes after that, water to zone 7 shut off, on schedule. But zone 5 never ran… system skipped to my zone 6 which ran as it should. @jameshtaylor Looks like Z7 is a flex daily end by sunrise and Z5 is flex monthly end by sunrise. What happened is that the order of schedules is Z7 -> Z5 stacking backwards (Z5 runs first, then Z7). Z7 decided to run that morning and pushed the Z5 schedule backwards to the time in the past when it could no longer execute. End by schedules stack backwards in order to satisfy the end by criteria. When you add a flex daily into the mix you can see schedules get pushed out of watering. I would recreate the flex daily schedule to give it a new created date so that it appears in the stack before Z5 or change it to start after a certain time, then you shouldn’t see this problem. I do not recommend using flex daily with end by configuration in general because of dynamic zone addition and not optimal start times mentioned here Flex daily water before sunrise broken. Let me know if you have more questions.